The MLS season has just started and some of its biggest stars are out for the rest of the year: Steve Zakuani (Seattle Sounders), Javier Morales (Real Salt Lake), David Ferreira (FC Dallas). Both Morales and Ferreira are MVPs for their teams--and the league--and means severe headaches for the coaches and the game in general. For Morales and Zakuani, additional punishment was dealt to their aggressors: a fine and 10-game ban for Brian Mullan and 4-game ban for Mondaini. But why the disparity? It could be that Mullan's challenge was not only "malicious" but also unnecessarily early. 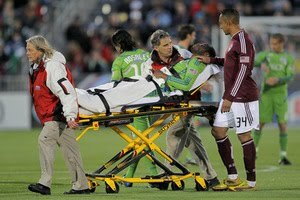 Zakuani was injured just three minutes into the match. It was a seriously damaging and disturbing challenge and warrants punishment. The ill-timed, unprovoked tackle was reminiscent of one inflicted on Arsenal's Eduardo a few years back by a Birmingham City player. But why the serious difference in punishment? Because Mondaini is an international player? Because it was later in the match? Because it was "more warranted"? No, it should be no different. And who's in the MLS disciplinary committee anyway? Soccer is about handling the ball with your feet and being smart in passes and tackles. One should always go for the ball, not the player. Sometimes, however, our feelings get in the way and our competitive nature betrays our sportsmanship. I was injured once while trying to tackle someone for a mistake I made. I could have injured him but instead twisted my knee, sidelining me for months. I never played again competitively due to other reasons, but I remember what it's like to be a competitor. The moral of this story is about fairness. Rash tackles deserve punishment, equal punishment to all that inflict them. Everyone gets hurt once in a while but this should not come from malicious, unprofessional challenges. These athletes are payed to entertain and have fun doing it, not for playing street soccer.